BOSTON, Mass. — Can you believe this year’s Stanley Cups Finals? In another nail biter between the Chicago Blackhawks and Boston Bruins, Brent Seabrook became the hero Wednesday night in Game 4 of the Stanley Cup Finals, when he scored the winning goal in a much needed win. With a laser slapshot in overtime in one of the the wildest games of the series, the Blackhawks now go back to Chicago for Game 5 on Saturday, June 22, with the series tied 2-2. With the home advantage in Game 5, the momentum may now be with the Blackhawks. 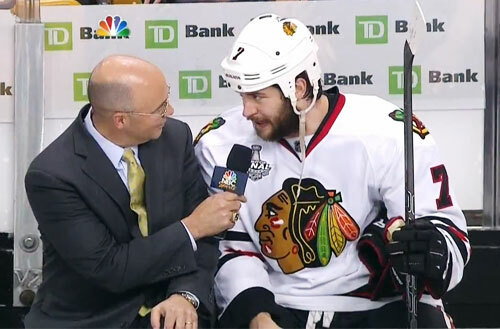 Photo shows Chicago Blackhawks, Brent Seabrook, speaking with Pierre McGuire after his OT winning slapshot in Game 5 of the Stanley Cup Finals against the Boston Bruins on June 19, 2013. Seabrook fired a 45-foot shot past Bruins goalie Tuukka Rask to end Game 4 with a 6-5 victory over Boston. Watch Brent Seabrook score winning goal in Game 4 of 2013 NHL Finals to tie the series 2-2. If you would like to book hockey players like Brent Seabrook for a speaking engagement, autograph signing, product endorsement, celebrity golf tournament, charity fundraiser or special corporate event, you can request Brent Seabrook agent and speaker fees at SportsSpeakers360.com. For booking agent and appearance fee information on how to hire Chicago Blackhawks players for appearances, call 1.855.303.5450.